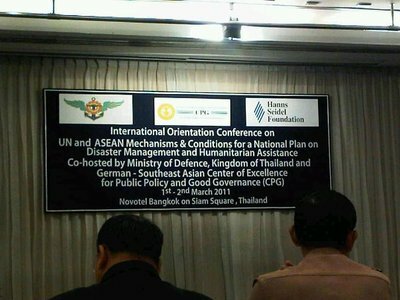 The International Orientation Conference on UN and ASEAN Mechanisms and Conditions for a National Plan on Disaster Management and Humanitarian Assistance Co-hosted by the Ministry of Defence, Kingdom of Thailand and German-Southeast Asian Center of Excellence for Public Policy and Good Governance (CPG). Whew! Pause for a deep breath after saying that. I’m just curious how the German-Southeast Center of Excellence for Public Policy and Good Governance managed to have only “CPG” for its initials. Shouldn’t it be GSCEPPGG? Needless to say, I have great sympathy for my friends and should probably buy them Starbucks gift cards for their upcoming birthdays. With a population of somewhere around 7 million, Bangkok has a fair number of parks and playgrounds. The city does a decent job of this, although many of them are under flyovers and in the center of cloverleafs (cloverleaves? ), which exposes them to pollution from passing vehicles. This one is located at the intersection of Petchaburi (on the right) and Ekkamai (the high ground on which I’m standing) Roads, as Ekkamai flies over Petchaburi. It contains several basketball, football, and takraw courts. 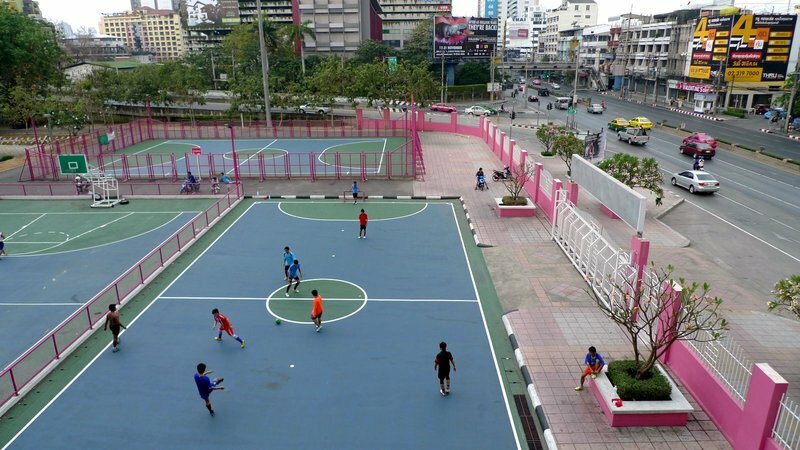 This particular playground has been adopted by Muang Thai Life Assurance, what in the US we would call an “insurance” company. This is all well and good, but sadly their company color is a shade of pink that reminds me of nothing more than pepto bismol. And they painted all the walls, benches, planters, and fences in this shade. 7-11 Trivia time: The three countries with the most 7-11 stores are the Thailand, the United States, and Japan, but not in that order. What is the correct order? Scroll down to find out. Finally, I spotted this sign while driving in the Silom-Surawongse area. 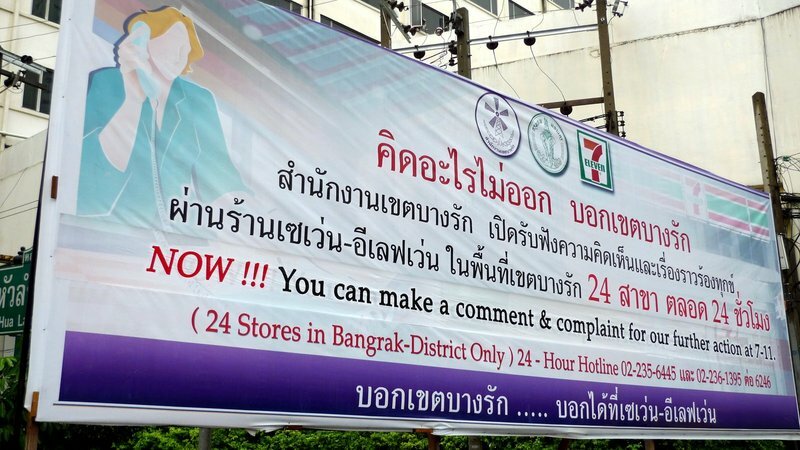 The Bangrak district government (districts being a subset of the larger city of Bangkok) has partnered with the ubiquitous 7-11 stores and you can now lodge comments and complaints directly at the 7-11 stores. While the sign is unclear in both Thai and English, I would assume that the poor cashiers at 7-11 stores are only trained to handle complaints related to the civic governance of the district. They will not be dispensing relationship advice, handling landlord-tennant conflicts, or doing the work that police through be doing. As for the 7-11s themselves, there are approximately 13,000 stores in Japan, 8,200 stores in the United States, and 5,800 in Thailand. One Thai friend recounted to us after his first trip to the US his surprise at discovering that there are 7-11s in the United States, too. We didn’t have the heart to tell him that 7-11 is not a Thai company. This entry was posted in Uncategorized and tagged 711, Assurance, Bangkok, Bangrak, Krungthep, Life, Muang, thai by christao408. Bookmark the permalink. lol! @keeping the fact that it’s not a Thai company a secret from him.And Japan really did take it to the next level with them stores, it’s fascinating. A friend wouldn’t mind checking out that place purely for the shade that playground has. And yes, that was too long of a title. Thank you and I hope you’re going to have a great weekend, as well! Interesting tidbit about 7-11! Are you enjoying the cool weather for the time being? That pink is awful… but maybe that is because it does remind of pepto bismol which certainly leaves a bad taste! Have a great weekend! @CurryPuffy – The cool weather is over, I’m afraid. Direct sun today is bringing the temps back up, although not as bad as they were five days ago. Middle of next week we’re supposed to have another high pressure system coming down from China so hopefully a bit more cool weather before we leave for Hawaii. @murisopsis – As a child I remember that instead of calming my stomach, the taste of pepto bismol would actually induce vomitting. @nov_way – Yes, the 7-11 stores in Japan are a bit different than in the US and Thailand. I guess each place adapts to the local culture. Years ago I was visiting a friend who was an interior designer for Starbucks and he was showing me their concept mock-up area in their HQ. He explained how they have to design the stores very differently in Asia, where people want more substantial food and to sit for a longer time than they do in the US. Interesting stuff. I find it interesting that the major companies adapt their designs for the local area. They may keep their logo but the interior and even products are aimed at the local culture. Someone does good research. Pepto Bismol does not appeal to me either. Holy smokes – that’s a lot of 7-11s. o_O*Convenience is a necessity, I guess.PS – I don’t know if it has arrived yet in Thailand but the green tea frappes at Starbuck’s are yummy. I don’t buy Starbuck’s because it’s too pricey and I don’t drink coffee but I tried my classmate’s and it’s good. I like the taste – sweet but not overpowering. Welcoming to my palate. cpg is probably short for some long jumble of german compound words that, when translated, results in that messy long name. or, someone got tired of writing so many letters down hahaha.huh, i find it odd that japan has the most 7-11 stores in the world. it doesn’t strike me as the kind of place that asians would flock to. maybe they are better outside of the us? 7-11 haven! I’m pretty sure we’re up on that list too. @christao408 – hmm… in that case, if the 7-11s here were more like the ones in japan, i might actually shop in them! @christao408 – Seriously? There’s gotta be more than 520! Could be true though, I believe 7-11’s are just found in major cities. Some provinces I’ve been to had no sign of 7-11’s existence. @oxyGENE_08 – Well, the number comes from 7-11’s corporate website, which you would imagine has pretty up-to-date figures. Who knows, though? @kunhuo42 – Agreed! LOLI was wondering about the pink color too, before I read your text. The pink playground should be called the Barbie Dreamhouse Playground maybe 🙂 That pink is pretty hideous! @TheCheshireGrins – Great name! Ha ha!